Since blueberries are low in calories yet high in nutrients, they may help you lose weight, which may help you fight diabetes. The Centers for Disease Control and Prevention reports that a 1-cup serving of blueberries contains just 83 calories and recommends replacing high-calorie snacks like chips with low-calorie fruits like blueberries as well as including blueberries in some of your meals. For example, you can mix blueberries with yogurt to enjoy a berry parfait for dessert. When laboratory rats in the University of Michigan Cardiovascular Center study were fed blueberry powder, their body weight and total fat mass decreased. 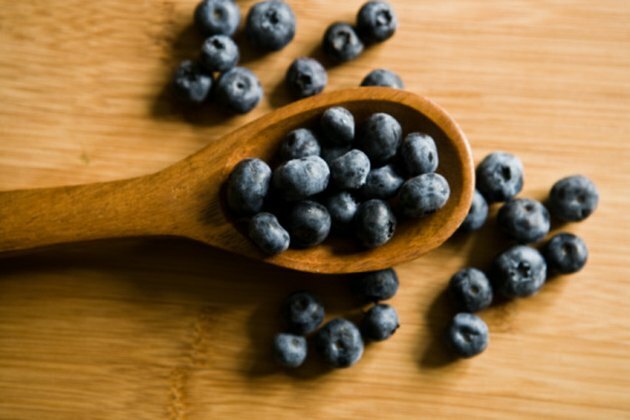 Researchers noted that the rats’ genes related to fat burning and storage were changed to help their bodies process fat more efficiently than before they ate blueberries, thereby reducing the rats’ risk of diabetes. Eating blueberries may help you lose belly fat, which is an important part of fighting diabetes, since excess abdominal fat increases your risk of diabetes. Fat cells in your belly produce hormones that can promote insulin resistance, which then can lead to diabetes. When the laboratory rats in the University of Michigan Cardiovascular Center study ate powder made from crushed blueberries as just 2 percent of their diets over 90 days, their amounts of abdominal fat decreased.